If you are Michael, please join here and update your profile! 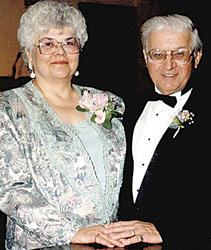 Mr. and Mrs. Michael Marinko of Warren were honored at a private 50th anniversary celebration on June 7, 2008, at the Cafe 422 in Warren. Mr. and Mrs. Bill Blanton of Canton hosted the party. Michael Marinko and the former Barbara Jean Tipper were married June 7, 1958, the first couple to be officiated at the First Presbyterian Church of Niles. Mr. Marinko retired in 1989 as a elementary teacher for Howland Local Schools, Warren. A Merchant Marine, Mr. Marinko served with the 1st and 4th Infantry Division, 82nd Airborne. He is active in the F&AM 250, Zem Zem, VFW, ACS, DAV and OEA (retired). Mrs. Marinko retired as a registered nurse in 1996 from Forum Health Trumbull Memorial Hospital in Warren. She is a member of the Christian Fellowship Group at Emmanuel Lutheran Church, were they are both longtime members. The couple have three children, Michael Jr. of Warren, Debra Mayer of Vero Beach, Fla., and Holly Blanton of Canton. They also have 3 Grandchildren.